Go to any Chinatown found in cities around the world, and you get that feeling of being transported to the Orient without even leaving the country. I'm sure many of us have enjoyed dining and shopping in these neighborhoods with their distinctive looking, colorful buildings. But less familiar to us would be the vanished Gold Rush Chinatowns that cropped up alongside mining camps. These places aren't as well documented as the boom-towns they grew up within, but in recent times there's been interest in these communities within a community. An archaeological dig in Deadwood, South Dakota revealed some clues of the life of the Chinese immigrants in the 19th century. What induce a person to travel so far to a land half a world away where everything from the language to the culture would be an unknown? In this case gold was the enticement. When word of the discovery of gold reached China, it set off a steady stream of migration. Chinese, mainly from the Guangdong Province, an area hit by the Opium Wars with Britain, revolution, famine, and crop failure, headed to America--note these immigrants would primarily be men venturing out alone, leaving their families behind. Unfortunately, making a fortune in the gold mines didn't always go as planned. Coming into competition with white miners, the Chinese soon found themselves given limited mining rights or restricted to mines that were thought to be depleted. In the face of that, the immigrants found employment building the railroad. But once the rail-line was complete, they had to find new occupations. They sought out ways that didn't compete with or threaten their white neighbors. Seeing opportunity in the mining camps, where there were few women in proportion to men, the Chinese set up businesses that catered to the miners: laundries, restaurants, housework, and restaurants for examples (water from washing miners clothes were screened for gold dust). 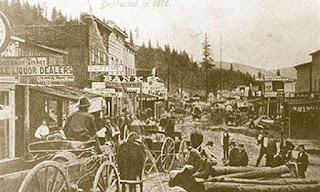 In 1870's, gold was found in the Black Hills and the town of Deadwood was born. 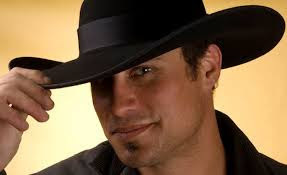 If you've ever been to Deadwood, you know it's built in a narrow gulch nestled in the mountains with little room to expand beyond its central streets. It's a crowded, bustling town, which I imagine was much the same back in its early days. It was at the south end of Main Street that the Chinese settled. We don't know how large the Chinese population was but it seemed to have ranged from over 200 to up to 500 residents. If you're a fan of the series Deadwood (and I am), you may be familiar with Chinatown pigpens being a convenient place to dispose of bodies. Fiction. That never happened, so let's start with putting that notion to rest. Likewise, don't imagine the Chinatowns you may be familiar, with the characteristic oriental features. Deadwood Chinatown seemed to have looked like the rest of the town. Nothing of it remains today. Buildings and people are all gone. In 2001 a team of archaeologists from the South Dakota State Archaeological Research Center began a four year project. Using old fire insurance maps, they were able to locate the area that was once Chinatown. A spot where a boarding house had burned down hid a treasure trove of artifacts, because the building collapsed on the contents of the house. Among the things found were gaming pieces, pottery, tableware, everyday personal hygiene aids, hair ornaments, Chinese coins, opium paraphernalia, and more. As unpleasant as it might seem, another place archaeologists get excited digging around in are the privies. Much of the trash of the day would be thrown into them. In addition to man-made objects, animal bones and botanical refuse, such as seeds, give clues to the diet of the people who lived there. Keeping in mind they didn't have a garbage collection like we do, the privy was a popular place to dispose of garbage like bottles or objects that had lost their usefulness. In all, after excavation over 600 boxes of artifacts were recovered and stored. The picture painted by the findings is one of a community that exported their lifestyle almost whole from China. From the pottery to the medicine bottles to opium, all were brought to America. There was a remarkable oriental-flavored homogeneity to the items unearthed. Even the animal bones tell us the Chinese preferred pork over the beef favored by their neighbors. Though the Chinese did coexist with the white community while holding onto their ways, cultural exchanges could not be avoided. In the artifacts found, mahjong tiles lay along side gaming dice. American beer bottles mingled with bottles that once held traditional Chinese medicine. What did the Chinese bring to their non-Chinese neighbors? 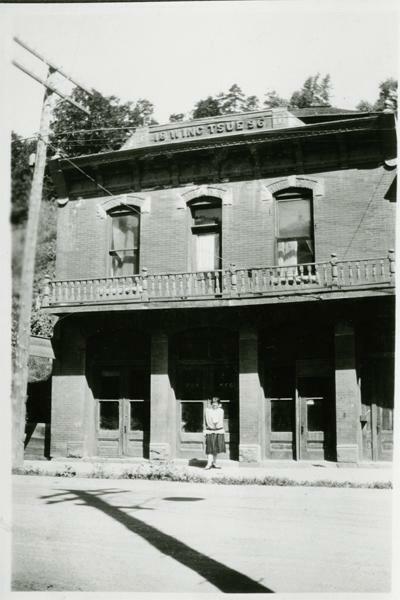 Of the eleven restaurants in Deadwood, seven of them were Chinese establishments, who not only served frontier fare but also introduced Asian food. Immigrant Fee lee Wong opened the Wing Tsue Emporium, a large store selling imported silk, medicines, porcelain, and other goods to Chinese and non-Chinese alike. Not to be bragged about, but we can't ignore one thing the Chinese brought to Deadwood: opium. The Chinese got the westerners hooked on opium just as the British had gotten the Chinese hooked on the drug. In the early days, opium dens were legal and were treated like saloons, in that to open one all you had to do was apply for a license. Later opium would be outlawed. Though living cheek to jowl with the other residents of Deadwood, the Chinese maintained their own community. For obvious reasons, they weren't going to blend in the way an European immigrant could, and often being targets for discrimination and even violence, banding together was a means for security and support. Chinatown even had their own fire and police brigades. All that said, the relationship between the Chinese and general population of Deadwood seems to have been relatively harmonious when compared to some of the other settlements of the day. The residents of Deadwood enjoyed Chinese parades and holiday celebrations which might include fireworks. As important and vital as the Chinese community was in the late 19th and early 20th century, it no longer exists. What happened and where did they go? Remember, this was a wave of migration that typically didn't include women and families. 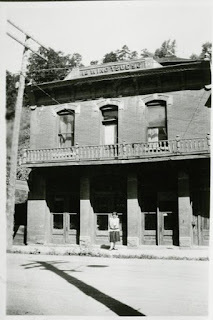 Of course there was a small group of females and children in Deadwood's Chinatown as represented by women's hair ornaments and such and children's toys found in the dig, but the population was heavily weighted on the male side. The typical Chinese male immigrant was sending money back to his family in China. He may have even been under contract, and when he'd fulfilled his obligation, he left America. To give the Chinese even less incentive to settle, the Exclusion Act in 1882, halted the flow of immigration from China, denying citizenship to even those born here. Men could not send for their families or brides. So when the gold dried up, there was little reason to stay in Deadwood. Just as the town was limited in growth by its geography, Chinese growth was limited by the society of the time. The Chinese moved on to larger communities like you'd find in San Francisco, or they went back to the East. But while they were there, the Chinese immigrants played an important part in society. In the Mount Moriah Cemetery situated on a beautiful pine tree dotted hill you can see the final resting places of such iconic figures like Calamity Jane and Wild Bill Hickok. You can also visit the Chinese altar and ceremonial burner. In 1908, the leaders of the Chinese community were given permission to build the altar and burner to honor their dead in their own way. In later years, decades after the last of the Chinese left, the altar and burner fell into disrepair. 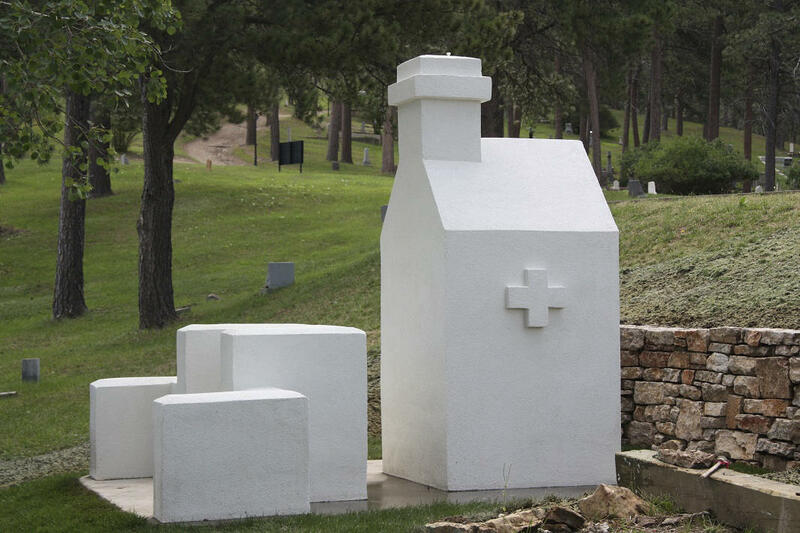 Then in the early part of the 21st century, long after all other traces of the Chinese presence were gone, the city of Deadwood reconstructed the altar and burner, using bricks saved from the demolished Wing Tsue Emporium, to construct it. To me this unimposing structure tells the tale of the Chinese in Deadwood, South Dakota: their emergence, acceptance, decline, and finally getting a place of honor in the frontier town they helped create. In the words of Fee Lee Wong's great granddaughter, Edith Wong, who came from California for the dedication of the new altar and burner. "The addition of this restored burner, just as the integration of the Chinese in a largely white pioneer community, signals acceptance of a different culture and a different way of life," Wong said. "What tangible evidence of the Chinese still exists in Deadwood? Really, not very much. Instead of solely an interpretive sign, this burner will be a physical reminder that the Chinese culture and traditions were definitely an integral part of Deadwood's history." Really fascinating piece, Patti. I had no idea there were Chinese in South Dakota though it makes sense with the gold rush there. Somehow I always envisage them as sticking to the big cities, or working on the railroad--for which they got little credit until recently. Thanks for sharing this with us! Thanks, Andi! It really is something to envision, isn't it? Other than the TV series, I learned about it from our trip to South Dakota and touring Deadwood. They talk about the Chinatown in the Adams Museum and we did visit the Chinese section in the cemetery. Thanks for stopping by! Really interesting, Patti. I've never been to Deadwood, but it seems so rich with history of the old west. It is, Kristy! It's kind of surprising how small it is but so packed with history. The cemetery is a beautiful spot and if you ever do go there, I recommend stopping by there: you get a map of where all the famous people are buried. Thanks for stopping by!